How to get the best results from your analogue thru-zero linear FM oscillator. An explainer in response to questions about the Doepfer A-110-4, but which is also applicable to other TZ-FM VCOs. The A-110-4 seems to be more prone to pitching artefacts than other thru-zero (TZ) VCOs. That might partly be due to the specific design, but general considerations like the tolerances and sensitivities of analogue designs also play a role. Another issue might be perception, e.g. 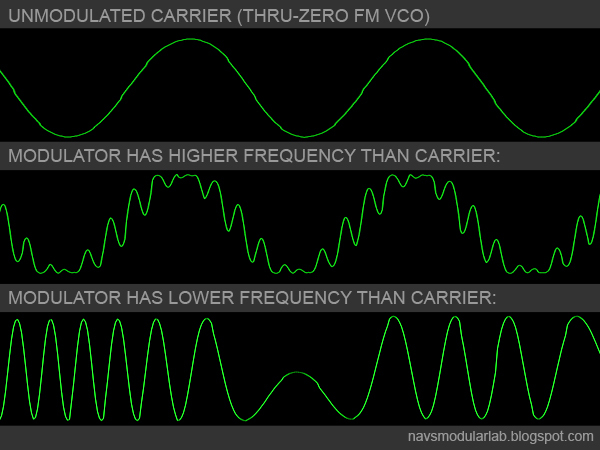 when certain modulation depths make it hard to discern the original pitch of the carrier. Ignoring the actual implementation (frequency- or phase-modulation), the reason digital FM is easy is because it’s clean. There are no DC offsets or pitch instabilities to ruin the result. The carrier was tuned to B3 and the modulator D#5. I chose these pitches by ear to show an effect which might be confused for pitching at higher mod depths. When the modulation recedes, we get a sound similar to guitar feedback. This shows that it’s possible to find combinations of frequency relationships and modulation depths that will sound ‘wrong’ even when patched digitally. In an analogue system, frequency drift or tracking inconsistencies can worsen the problem. To avoid this, some FM inputs are AC-coupled - the signal is filtered by a capacitor. But this is not a magic bullet. If the offset is large enough and being swept dynamically, the capacitor will have a hard time eliminating it. The most likely cause for DC offsets are the modulating oscillator itself, or more precisely its wave-shaping circuitry. I have had best results with Doepfer’s A-143-9 Quadrature sine-core oscillator. Analogue TZ-FM involves switching to generate ‘negative frequencies’. No matter how finely timed, there is a moment of indecision which may be audible as a growl or rumble. DC offset makes this worse as it shifts the switching point. Lower initial frequencies (aka Bias, Symmetry or LFreq) allow more modulation and brighter sounds, but the cost is lower accuracy and more ‘bum notes’. 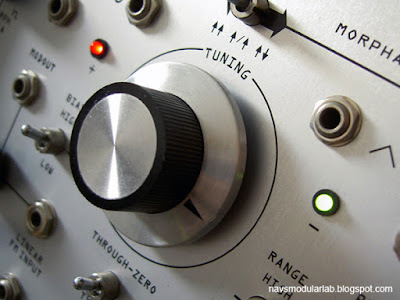 The Doepfer TZ-VCO switches between two oscillators. This method has pros and cons. If the two VCOs do not respond equally to modulation, the resulting FM will sound ‘off’, even if the modulator is clean and the switching point is accurate. This cannot be trimmed by the user. To mitigate pitching artefacts at the point of switching, calibrating the TZ transition can help. As Cynthia Webster says in her humorous video showing the difference between thru-zero and normal linear FM, without TZ “half the modulation is gone”. 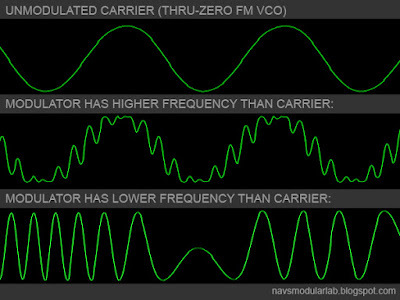 As you’ll hear, the frequency relationship between carrier and modulator also plays a role. The first VCO you hear in the next two examples is the Zeroscillator, then the A-143-9 which I have modified for standard linear-FM. I have concentrated on the audio effects here, but VCOs that can go thru-zero have other uses when they themselves are used as modulators. For an idea, try this patch for a thru-zero frequency shifter and listen to your sounds swap stereo sides. I hope this explainer helps you with your TZ-FM experiments. The files folder is here. If you’re not sure about the analogue results you’re getting and need a digital ’control’, download the Clavia Nord Modular G2 demo. If you’re on a Mac and 10.7 or higher, you can run the demo under Wine. There is info here or an installer here.